A dental implant is the most natural looking tooth replacement option available in dentistry today. 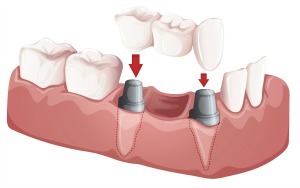 A dental implant replaces both the lost natural tooth and its root. 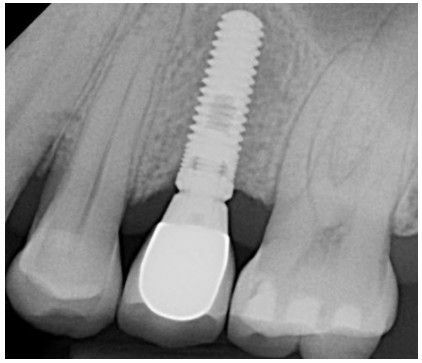 A titanium screw (visible on a dental x-ray) replaces the root portion of the tooth and a tooth colored dental crown replaces the visible portion of the tooth above the gums. Clinical studies over the past 40 to 50 years indicate that dental implant treatment has a success rate well over 95% (Source) and often outlast other tooth replacement options if properly maintained (daily brushing and flossing) and routinely examined by your dentist. Dental implant surgery is performed by a dentist with advanced training and expertise in the placement of dental implants. During the initial surgery, the dentist will surgically implant a titanium screw into the jawbone. This screw will replace the root portion of the missing tooth. Over the next two to six months following the implant surgery, the tooth implant and the jaw bone are allowed to bond together to form an anchor for a dental implant crown. 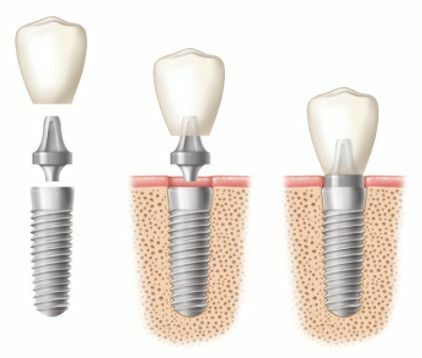 Once healed, the dentist will uncover the implant and attach an extension commonly referred to as an abutment. This abutment will enable the dentist to fabricate and permanently cement a dental implant crown. The crown is tooth-colored and shaded to match adjacent teeth. Every case is different and largely depends upon the condition of the jawbone, number and type of implants being placed, as well as a person’s medical and dental history. The implant process begins with a consultation. At the consultation, the dentist should be able to provide you with an estimated timeline to complete the process. Generally speaking, a dental implant from start to finish can take 6-9 months to complete, longer for complex cases. Placement of a dental implant requires advanced training and is a specialty. For this reason, most dentists collaborate with a specialist dentist to place the actual implant. This specialist is either a periodontist or an oral surgeon. Dentists have established relationships with specialists and will provide you with a referral for an initial consultation. While the up-front cost of a dental implant is more than other tooth replacement options, a tooth implant can last a lifetime—less expensive in the long-run. The cost of full mouth implants depends upon the number of implants placed and if the missing teeth are located next to each other, and/or are in the same arch (top or bottom teeth). All on four dental implants are a great option for people with no natural teeth in their mouth. Four implants are strategically placed, two in the front, and one on each side in the back. A complete denture is fabricated and securely locks into place over the four implants. This enables a person with no teeth to chew, speak, and avoid a potentially embarrassing social situation, teeth falling out. An increasing number of dental insurance carriers have begun to provide some level of coverage for the placement of a tooth implant. Coverage will vary by insurance plan. If you’re considering a dental implant, your implant dentist can submit a predetermination of benefits to your dental insurance provider following your initial consultation. No dental insurance carrier is going to provide full-coverage for a tooth implant. Many patients require a flexible payment plan that can fit within their monthly budget. Care-Credit is one option to consider. 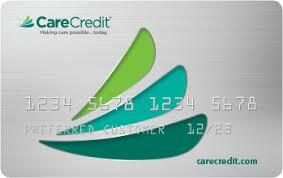 Care Credit is a healthcare line of credit for those who qualify. They offer flexible payment options. Additionally, it is not uncommon for people to have the tooth implant placed in one dental insurance coverage year, and the dental implant crown placed in the following dental coverage year. This helps to defray the entire cost at once. A dental implant is not the only available option to replace one or more missing teeth. In all, there are four tooth replacement options to consider. A single tooth implant with a permanently cemented crown over the implant. A fixed-tooth supported bridge replaces the missing tooth and is supported by two or more adjacent teeth to the missing tooth, like a bridge (pictured right). Just as the name implies, a partial or complete denture is a removable oral appliance with acrylic or porcelain teeth. Another name for these appliances are “false teeth”. There are some circumstances for which a replacement tooth is not necessary as it will not alter your ability to chew or is visible when smiling. No treatment is necessary following the removal of wisdom teeth as well as some second molars. Your dentist will discuss your options after examining your bite, teeth alignment, and proximity to the visible smile line. Call (763) 586-9988 to schedule a complimentary consultation appointment with Dr. Cretzmeyer. He will examine your teeth and discuss the pros and cons for each available option.